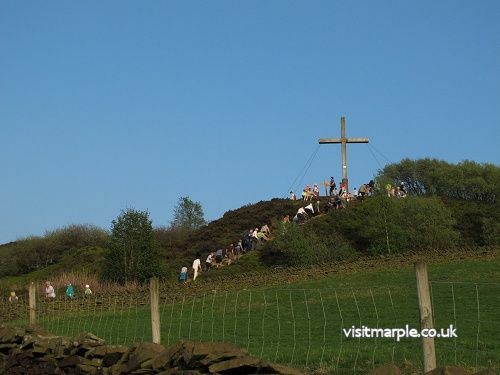 As the cross was originally erected in March 1970 by the then Marple Council of Churches, the Churches in the area have taken on the responsibility of restoring it. Professional advice has been taken and it has been decided that, as the remaining T structure is also now showing signs of decay, it would not be wise to repair it. It was agreed at the Churches Together meeting in September 2017 to take down what remains of the existing cross and replace it with a stronger structure of galvanised steel clad with timber to retain the original appearance. 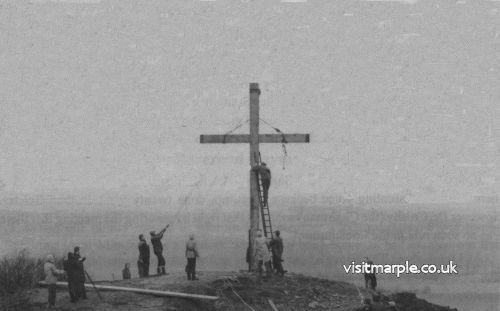 The original cross was made by a local carpenter and erected one afternoon by a group of men from the local churches who carried the wood pieces up the steep hill to Cobden Edge. They then put the cross together on site using a long ladder and ropes. It would not be possible to repeat this process because of present-day Health and Safety requirements. This time it seems necessary to employ a local professional construction engineer. He hopes to do the work in the Spring of 2018. In the meantime the group Churches Together are raising money. It has been estimated that £25,000 is needed to cover all costs. Some churches have already made a start with fund raising events. It is hoped that others will be able to follow their example. Many people, churchgoers or not, value the cross overlooking our community and have been asking when it will be restored from its present T-shape to become once again the much loved local landmark. We are therefore also appealing for the support from the wider community in helping the target to be reached. On Wednesday 13th December Churches Together were awarded £1,000 from Marple Area Committee's Flexibility Funding, which gets their appeal off to a great start. Churches Together have an on-line donation system set up that allows Gift-Aid to be included on personal donations by UK tax payers. You can donate on-line to the Mellor Cross Appeal with Gift-Aid via this link or by clicking the MyDonate Button. For more information visit the Churches Together web site or ring Marian Thompson on 0161 427 7254.